You should only register once per company and if you need to grant other people from your company access to SurveyToGo – just create users for them and send them the user details and organization name. Only you and the users that you create have access to your organization. All the surveys that you will create will be created in your organization and cannot be accessed by anyone other than you and the users that you create. What are Organization Users and how do create a new one? Organization users are users that are in charge of managing customers, operations & projects and are not the ones performing the actual surveys in the field. Surveyor users are users that are responsible for actually conducting the surveys in field. By default the surveyors do not have access to the Studio. Both user types have a password and a user name and you can define as many users as needed of each type. You can also organize them into relevant groups for easier maintenance. 3. Step 3: provide organization users with access to projects? 4. Step 4: create new groups of organization users? You need to make sure you give out a user name and a password for each organization user that you create. Once you are done filling out the information click the “Create” button. ** The way to add surveyor users is the same, by right-click on the Users folder of the “Surveyor Users & Groups” node. Step 3: provide organization users with access to projects? Step 4: create new groups of organization users? This will open up the new group screen and will allow you to add members to this group. You can then later add this group as project managers as shown above. This will show you the group rights screen. This document contains most of the common every-day usable functions in SurveyToGo. This document is directly connected to us, and is constantly updated with new functions and info by our professional team, stay updated! A Survey Script Writers True Gem! Explanation: This function gets a target question index and a source question. It filters the Current Question’s answers through, according to the answers chosen in the source questions specified. 1st Parameter: The Target Question. 2nd Parameter: A Boolean value – ‘true’ for showing answers selected, ‘false’ for showing answers not selected. 3rd Parameter: The Source Questions. 1st Parameter: The Target Question index. 2nd Parameter: A Boolean value – ‘true’ for getting the ‘Other Specify’ input too, ‘false’ for not getting the ‘Other Specify’ input text. and returns its selected answer index. Explanation: This function gets a target question index of only Multi-Selection questions and an answer index, and checks if this answer was selected. 2nd Parameter: The Target Answer Index. Output: returns ‘True’ if the given answer was selected – returns ‘False’ if the given answer was not selected. Explanation: This function gets a target question index, a answer\topic index, and a Boolean value (true/false), and shows\hides the given answer\topic. 2nd Parameter: The Target Answer\Topic Index. Explanation: This function gets a target question index of a ‘Single-Choice-Grid’ question only, and a topic index. it returns the index of the selected answer in the given topic. 2nd Parameter: The Target Topic Index. Output: returns an index of the selected answer in the given topic within the given multi-topic question. Explanation: This function gets a target question index of a multi-selection question only, and returns the number of selected answers. Output: returns the number of selected answers. Explanation: This function gets a target question index of a Single-Choice Grid question only, and returns the number of topics. Output: returns the number of topics. It returns the answer of the target question in the given Iteration Index. 2nd Parameter: The Specific Iteration Index. Output: Returns its answer in the given iteration index within the loop. *NOTE:IterationIndex Represents the current iteration when running within a loop, so it’s value is set according to the iteration which is currently running. Explanation: This function gets a target question index of questions that are within a loop of only multi-selection question, an answer index and an iteration index. It checks if the given answer was selected in the target question within the given Iteration Index. 3rd Parameter: The Specific Iteration Index. Output: returns ‘True’ if the given answer was selected in the given iteration – returns ‘False’ if the given answer was not selected in the given iteration index. Explanation: This function gets an integer and returns a random number between the 0 and the integer number given minus 1. Output: returns a random integer within the given range. Explanation: This function gets a target question index and a Boolean and returns a text string with all the answers chosen in the given question index, separated with a comma. 2nd Parameter: ‘true’ for including any ‘Other Specify’ text, ‘false’ for not including any ‘Other Specify’ text. Output: returns a text string with all the answers chosen in the given question index, separated with a comma. Output: doesn’t return anything, just sets the answer given. Filling out surveys in response to conditions. For example: a survey for a retail store, that requires a different survey if the store was close. Filling out surveys in response to events in the field. For example: general medical device survey, where if while filling out the general questions, the patient suddenly reacts you need to fill out a survey about his/her reaction then continue back to filling the general survey. Each child survey is rendered as a menu option on the device allowing for quick ad-hoc filling of child surveys. Then, click the “…” button to select the actual child survey from your existing surveys. Please note you can select any survey you want, and you can have a survey be a child survey of more then 1 parent. Click the “+” button to add more surveys or the “OK” button to finish. 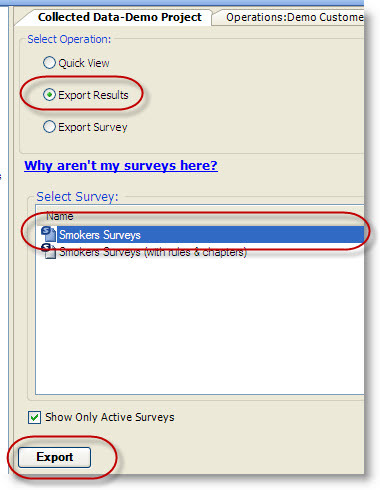 You can then select the relevant child survey from the list of surveys. This will start a new run of the child survey, after which you will return to the current survey. To edit surveys you have already conducted tap the “Edit Additional Surveys” menu option, and then select the relevant survey. How to change the “Data” field of child surveys for later editing? Additional data that can be associated with the child survey run. The SubjectData is a variable that can later be presented as additional attribute of the survey on the Operations Console and assist with identifying a specific survey run. An example can be a survey of a household that then calls for a child survey for each member of the family. You can call the child survey with the family member name by entering ChildMgr.StartChildSurvey(<Member Name>); or you can set it from within the child survey if the surveyor codes the name as one of the child survey questions. It will then be presented in the Operations Console and in the Additional Info column of the survey result in the surveyor’s device. Please note you can interact with the “SubjectData” variable anywhere in the questionnaire, including Expression questions, start/end question scripts etc.. The most efficient way to perform information exchange between child and parent survey is by using the Parent object from within the child survey. You can call any SurveyToGo function by using Parent. for example Parent.Answer(1) would return the value of question 1 in the parent survey. Parent.SetAnswer(1, 2) would set the value of question 1 in the the Parenet survey to 1. SurveyToGo is enabled by default to accept any file that is created during the survey as an attachment to the running survey result. Because of this, any pictures that you take during the survey or any sounds that you record during the survey are automatically attached to the current survey result and will be sent along with the result to the server. Multimedia questions are types of questions which allow you to choose whether it will record Picture, Sound or Video. Now, once the survey is running, you can capture the multimedia you chose by using the action button that will be displayed in the question. The Clear button will clear the latest multimedia file captured. Any multimedia that you capture while you are in a survey is automatically bound to that survey result. Continue running the survey normally and once you synchronize the results back to the server, the pictures are synced with the results. You can view attachments of specific results in the operations console. Enter a result, and go to its answer’s tab, there you can see their attachments and the question the attachment was captured. You can also view the attachment through the link to our server and save a local copy. 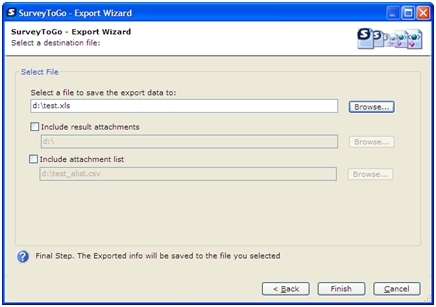 Attachments can be exported through the regular exporting wizard while exporting the results of a survey. ‘Include attachment Results’: If you specify this option and select a folder location, any picture attachment that was included in the results will be placed in this folder. The name of the picture will be according to the relevant SubjectID field in the results file. ‘Include attachment list’ : If checked, you can choose a csv file that will receive a list of links to the various pictures that were included in the results. This is useful if you need links to the attachments instead of the actual pictures. Both options can be selected together. In the last screen of the export wizard, you can specify the folder for the attachments and choose your attachment exporting configuration. 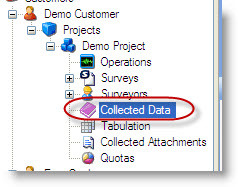 Include result attachments If you specify this option and select a folder location, any picture attachment that was included in the results will be placed in this folder. The name of the picture will be according to the relevant SubjectID field in the results file. Include attachment list If checked, you can choose a csv file that will receive a list of links to the various pictures that were included in the results. This is useful if you need links to the attachments instead of the actual pictures. 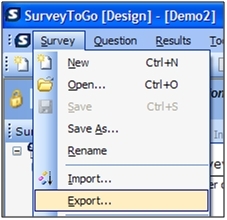 SurveyToGo enables you to export the data of a survey at any point, to a number of different applications & formats. Furthermore, additional export providers can be written easily to support additional formats. Currently, the supported formats include MS Excel, MS Access, SPSS & XML. When exporting, you have complete control on the order of the exported columns, enabling you to separate the way the survey is presented from the way the data is to be exported. Please note only active surveys will be displayed in the list. If your survey is marked as “Draft” or “Closed” then it will not be shown. If you need to export results of closed surveys, simply change their mode back to production or test. Simply select the desired export provider and click the Next button. When done you can either click the columns order tab to change the columns order settings, or click Next to continue. The columns order screen allows you to define the exact order of the columns you would like to have when exporting the survey results. You can choose to export all or only a subset of the columns available, or even export a column more then once. Both the left list and the right list support multiple selections (by using the Shift and or Control keys) and are completely sort able by any column you desire. When you are done configuring the order and number of columns you need to export, simply click the options tab or click Next to continue the export process. Note: export settings are saved on your computer for the when you need to export the same survey again. Left list – Source columns Contains all the available columns. You can select one or more columns from this list to move to the output columns list. Internal columns, like the ‘duration’ column etc have a yellow background while survey specific columns have a white background. The list supports multiple selections & sorting. To sort, simply click the column of the list you would like to sort by. Up/down buttons Control the actual order of the columns. You can select either one or more columns and press the up down buttons to move these columns up or down. Left/right buttons Control the movement of columns between the left and right list. The options screen allows you to specify some general options regarding the exported file. When you are done, simply click the Next button to continue. Include Filtered Out subjects Subjects who participate in your survey can be filtered out from the survey due to certain conditions. If checked filtered out subjects will also be included in the exported file, and an additional column – “Filter” is added to the exported data. The “Filter” column contains the index of the question the subject was filtered at. Export only results submitted between… and … Enables you to specify a date range for the exported results. If specified, only results from the specified range are included in the export. Swap rows and cols If checked, the results are exported so that each subject is a column, and each question is a row, instead of the regular format where each subject is a row and each question is a column. The file name selection screen allows you to enter the name of the output file name. When you are done, click the finish button to continue. Answer Yes to open the exported file using its associated application, or no to continue without opening the external application. Then choose a file name and click the finish button. The survey will be saved to the path you indicated. Printing a survey can be very useful for both keeping a hard copy version of the survey & for sending to clients & team members for review. 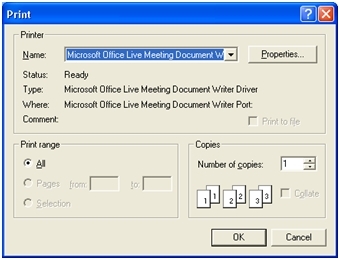 You can both directly print a survey or perform a print preview. 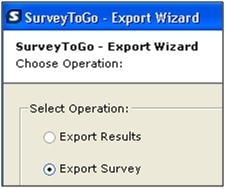 SurveyToGo contains an enormous set of built-in functions ready to use. We have assembled all of them in one file – a useful handbook for scripting surveys. It contains all the functions but in a more raw form. We are in the process of moving them from this file to a more elegant web manual. The beta version of the web manual is here: http://stg.dooblo.net/ULDocs – but it is only in beta so please expect things to be a bit weird with it. We strongly recommend having this, Very Handful! SurveyToGo is enabled by default to use the GPS tracking feature of your devices without any pre-configuration needed. Now you can track your surveyor’s location, know their route of movement and follow the specific location where surveys were conducted. This feature gives field-managers and any other back-office teams a whole new aspect of benefits in organizing, managing and supervising your field team. On your SurveyToGo Studio software, on the left side, where the main tree of your organization is, you can notice that there is an expandable node called ‘GPS Tracking’. This node will allow you to see all latest surveyors’ locations tracked by the GPS feature in their devices. This button will provide you with the map, showing the latest surveyor locations tracked. You can define your search according to a specific user, specific group or all users at once. Here you can define the time scale according to the time you want to track locations. From five days ago until two hours ago. You can save the map provided in step 1 as a Google Earth file. After you click the ‘Get latest locations’ button, you would be provided with a map showing the latest locations tracked. In the upper part you have a navigation bar, you can move by using the mouse as well. If you float with the cursor above one of the location pins, you can see the specific user, time and date that this location was tracked. In the bottom right corner, you can see the view scale of the map. The map indicates street names and important locations name as well. This node will allow you to view specific routes that the surveyors did, according to the order of the locations tracked. If you double click this node, you would get the following menu. Here you can choose the user to track its route, if you click the ‘Get User’s route’, it will provide you with a map indicating the users route. Here you can define the time scale for viewing the route. After you click the ‘Get User’s route’ button, you would be provided with a map showing the route of the user chosen. The red triangle sign indicates where the route has begun. The red square sign indicates where the route has finished. The small ‘S’ sign indicates a location where a survey has been conducted. The green lines indicate the route of the user, following the locations tracks according to their order. If you float with the cursor above any of these items, you would get the user, time and date that the item had been tracked. If you go under the ‘Map’ tab, you would be able to view the specific place where this result was conducted. You can copy the specific coordinates to your clipboards. If you float over the location pin with your cursor you would see the user, time, date, result number and survey name.